Pollen, a father of three, who inherited the business several years ago from his mechanic friend Adam Murray, now finds himself in a quite worried state. The garage supports his entire family and a few mechanic assistants. The closure would force upon him difficult decisions at a time already not easy due to the economic downturn of the past years. Pollen says it could take years to rebuild the trade at a new location and he is hoping he can find a replacement workshop close to the current location. He is appealing to anyone with suggestions of potential locations in the area nearby, from where he could continue to operate. The reason for Pollen’s demise is the fact, that the landlord is clearing 18 Acton Street for refurbishment to modernise it and convert the entire building into flats. Pollen says, that legislation has changed recently, making it easier to convert commercial units into residential properties. Apparently some of the residential tenants above the garage have also been told to leave. The history of the business goes back decades. 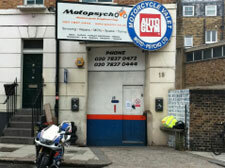 Prior to running the garage from Acton Street, the business was run from a unit on Kings Cross Road, but moved eventually into the spacier premises in Acton Street. Just a few years ago Pollen had to upgrade the garage for fire hazard safety at much personal expense. It is yet another tale of a long standing blue collar businesses being forced to vacate the Southern side of Kings Cross. Recently the Jaguar garage on Gray’s Inn Road, also shut for good, with the rooms currently used as a make shift car-park. I think the owner of the building has got this wrong. In most places, the law changed making it simple for a landowner change from commercial-to-residential (one of the Tories’ sillier changes to planning law). However, this does not apply to certain areas, especially in central London, where the Boroughs demanded exemption and got it (or some of it anyway). I understood that all land within the “CAZ” (Central Activities Zone) in London was excluded from this easy-convert change in the law. So Keith Pollen’s landowner may be mistaken in thinking he can get a simple conversion to residential. Really sorry to hear this. Keith is a nice guy and provides a very good service. I hope he doesn’t go far so I can carry on using him to fix my bike.